Is Transitional Farming the New Natural? "Humanely raised," "pesticide-free," "hormone-free," "organic," “transitional,” “biodynamic.” These are a sampling of terms that consumers associate with how food is produced and have increasingly become a driving focus of food-forward consumers, most notably in the world of organics. One consistency we've seen within our research on what drives consumers to purchase organics is a profound curiosity and interest in authentic stories of production, all the way down to the farm and agricultural level. While consumers who buy organics do so because they envision growing practices associated with an absence of chemicals and humane treatment of animals, they are also driven by strong romanticized notions of the moral ideals of farming. This idealization of farming stems from the fact that though a majority of "modern" consumers are fundamentally disconnected from food production, they retain a highly idealized picture of how they would like their food to be produced. Pragmatically, consumers know that this is not how the world is, and they acknowledge the necessities of providing food that is affordable and accessible. However, the realities of industrial farming are uncomfortably distant from their ideal, and they appreciate opportunities to feel closer to it. Our Organic and Natural 2018 report finds that Core organic consumers (who make up 24% of the current 85% of consumers who buy organics) are increasingly seeing ideal agriculture as becoming less about an absence of chemicals and more about the cultivation of healthy soils and ecosystems. Paying attention to Core consumers is important, since they are a barometer to trends that may go mainstream in the future. 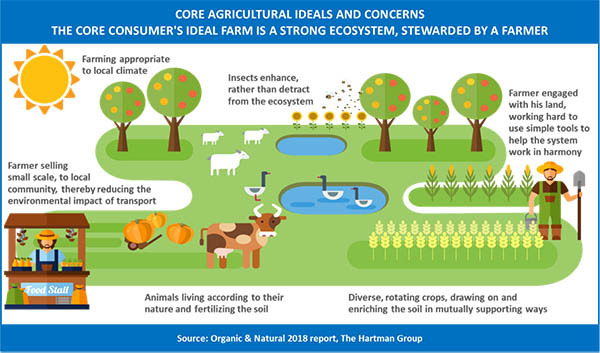 As the following illustration depicts, the Core consumer’s perception of the ideal farm is a strong ecosystem, stewarded by a farmer. Here, the farmer is less reliant on tools for changing the system and more reliant on adapting to its realities. Despite consumer notions of ideal agriculture and growing demand for organics, only 1% of U.S. farmland is certified to grow organic crops. To help compensate for that, Certified Transitional, an independent labeling system, was developed in 2016 to check for organic compliance during a three-year switch-over period, enabling farmers to sell their products under the “Certified Transitional” label. Awareness of transitional farming is currently low but increasing. In 2016, we found only 13% of consumers had ever heard of the term "certified transitional farming." In 2018, that number has increased to 40%. The media has helped foster excitement for yet another progressive agriculture movement: vertical farming. Touted as “the future of food,” consumer knowledge on the subject reflects a growing awareness. In 2018, slightly more than half of consumers (53%) said they were familiar with the term, according to our Organic and Natural 2018 report, while 29% of these consumers said they know a little or a lot about it. Consumers have a highly idealized notion of farming and appreciate opportunities to buy products that reinforce those ideals. As we observe the most active organic buyers today, through exposure to the environmental impacts of both industrial and sustainable farming methods, we expect consumers will increasingly be more inclined to make significant changes to their lifestyles, with a focus on more sustainable diets. For the foreseeable future, organic will remain for most consumers the gold standard of a safer, higher-quality product. Organic communicates freedom from chemicals (on the farm and during production) as well as a product that is better for the world. At the same time, our most current research finds that Core consumers idealize food and agriculture that go beyond organic, and for them, organic no longer represents the highest ideal for how their food is produced. 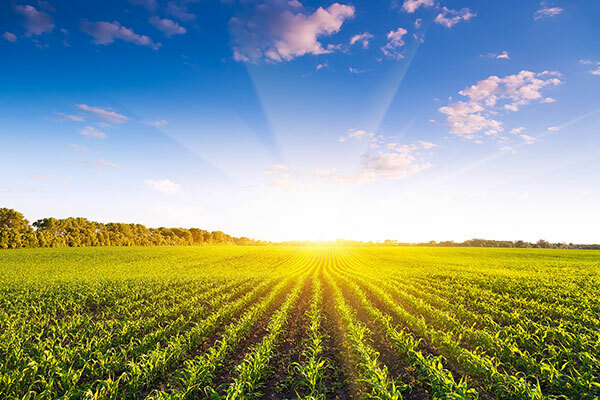 Many of the principles that Core consumers idealize are encapsulated within biodynamic farming practices and equations they make between soil health, wellness and sustainability.